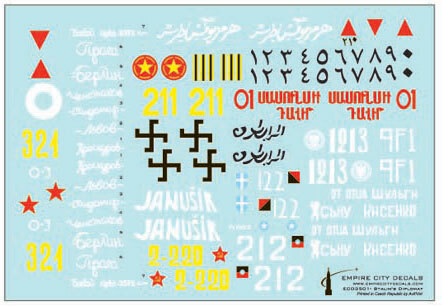 Empire City Decals' first soujurn into armoured vehicles is a 1/35 scale sheet entitled "Stalin's Diplomat: T-34 Tank". This release covers 15 T-34s in service with a wide variety of operators from the end of the Second World War until the 1980s. Nations covered include Angola, Armenia, Cyprus, Czechoslovakia, Egypt, Finland, Lebanon, North Vietnam, Poland, Somalia, Syria, Yugoslavia, and the Red Army. Empire City Decals has clearly gone to a lot of trouble to seek out some unusual and interesting colours and markings for these 15 options. The decals are printed by Aviprint from the Czech Republic. They are in perfect register and carrier film looks very thin. 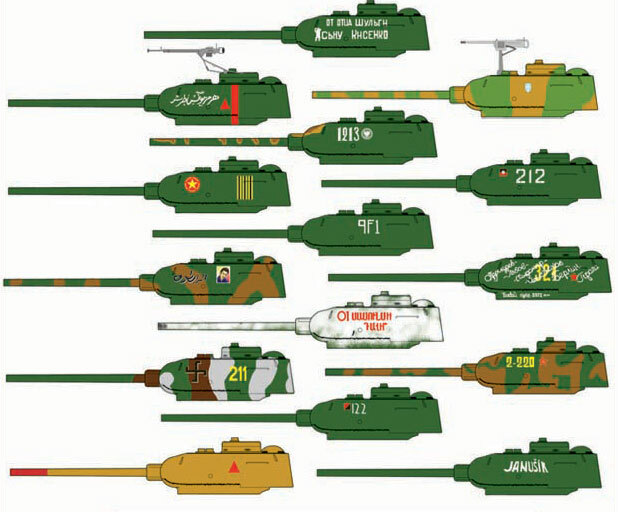 A small paper sheet is also provided with full colour posters meant to be cut out and stuck to the turret sides and hull front of the Lebanese option. Instructions are supplied on cardboard in full colour. The only negative aspect of this package is that the illustrations are limited to one side of each turret, although helpful notes for each option are also provided and hull markings, where applicable, are highlighted on a separate diagram. The instructions do point out that most of the schemes included are based in a single low quality photo, so you'll be on your own for ovrall camouflage schemes. Empire City Decals' 1/35 scale decals, "Stalin's Diplomat: T-34 Tank", is a high quality offering that will appeal to fans of WWII and post-war T-34s.